Dental bridges, as the name implies, bridge together spaces between your natural teeth by way of custom, placeholder teeth. These placeholders prevent shifting of your smile, ensuring your bite doesn’t change over time. With an extensive background in designing and placing dental bridges, Inri T. Hsu, DMD can restore your smile with a custom bridge. Book your exam at Pecos Dental in Henderson, Nevada by using the convenient online booking system, or by calling the office. The purpose of the bridge is to prevent teeth from shifting, allowing you to continue to bite, chew, and speak normally. It also helps keep your smile in alignment. Yes. With traditional bridges, you have two anchor crowns and a pontic (false) tooth between them. These are the most common types of bridges used to replace teeth in the back of your mouth. If the bridge can only be attached to one tooth — for example, to replace a molar behind the rest of your teeth — you will probably need a cantilever bridge. A cantilever bridge involves attaching the pontic tooth and one anchor crown to just one abutment tooth. If you’re missing one tooth at the front of your smile, a Maryland bridge will be your best option. These bridges allow the pontic tooth to fuse to the remaining teeth beside it via a metal band. The band on each side of the false tooth attaches to the surrounding teeth with resin cement. What happens during a bridge appointment? During your bridge appointment at Pecos Dental, Dr. Hsu will take current X-rays, if needed. The next step involves prepping your abutment teeth by filing them down. That allows them to serve as a foundation for your bridge. You will then get impressions made of your teeth. If your teeth are sensitive after the procedure, you might need temporary crowns. Dr. Hsu will then send your X-rays and impressions off to a lab where your custom bridge will be designed within 1-2 weeks. You will have a follow-up appointment at which Dr. Hsu permanently bonds the bridge to your teeth. Dr. Hsu can file down any areas that don’t feel comfortable for you. Once your bridge is in place, it can last between 5-7 years or more. 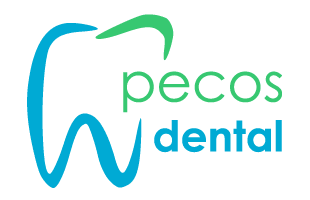 Booking your dental bridge appointment at Pecos Dental is as easy as calling the office, or using the quick online scheduler.